Unique earth & live clamp fittings. Variable pulse speed to extend battery life. A very versatile unit with many features that belies its price. 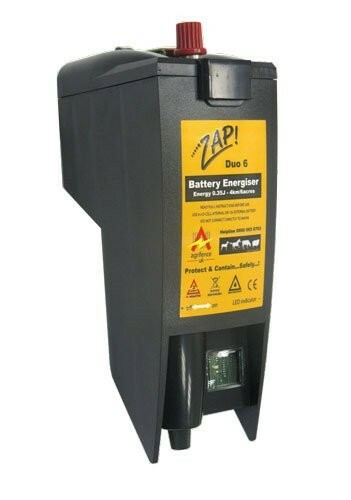 The Duo 6 can run from either 4 x D-Cell torch batteries or from a 12v rechargeable battery. It is a very popular equestrian fencer and its portability makes it epecially attractive for weekend show use. It can power up to 6 acres of paddock in good conditions. Supplied with all necessary leads.